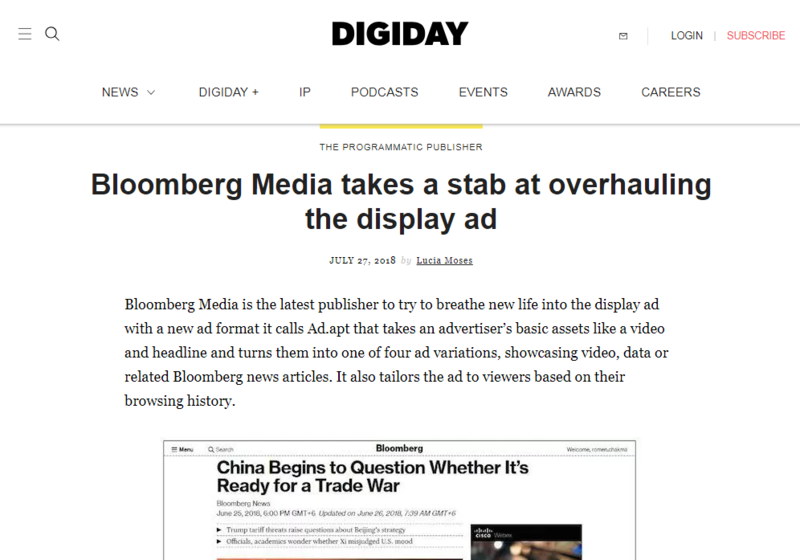 Bloomberg’s industry unique Digital Ad Innovation group, a team of creatives, technologists and data scientists, continuously innovates to bring advertising partners powerful new connections with our audiences. Brands' organic social post distributed as a mobile display ad. An innovative new ad technology platform that allows partners to “trigger” the right brand message, in real-time, at the moment that matters most to their business. Capture your audiences’ attention on the Bloomberg network and off-site on Facebook, Twitter and Instagram. Mobile impact: ScrollView 250 and Scrollview 700 reveal a brand message as part of readers' scrolling motion. Match our most-read stories with your brand on influential Facebook feeds – in real time, at scale. Innovative rich media unit showcases your brand's best assets in an interactive sequence. Connect the power of VR and 360˚ experiences with Bloomberg's influential audiences with our breakthrough immersive capability. Intrinsic engagement: Scrolling of page reveals a layered ad unit that simulates depth of motion as the user scrolls down. Authentic attention: Scrolling of page reveals a single-frame ad unit as a background layer behind the page, opening an unexpected avenue for messaging. Real-time content alignment opportunity captures the moment readers are most likely to engage and share by dynamically pairing a top trending story with a partner’s existing creative in a custom 300x600 unit.